Used for centuries by the Chinese, the red berries of the lycium bush have earned a legendary reputation. 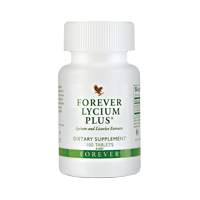 Forever Lycium Plus utilises extract of the lycium fruit and liquorice root. Take 1 tablet 3 times daily. Lycium extract, emulsifier (microcrystalline cellulose), thickener (cellulose, croscarmellose sodium), Liquorice avonoid extract, anti-foaming agent (stearic acid), stabilizer (magnesium stearate), anti-caking agent (silicon dioxide), dextrin, medium chain triglycerides, dextrose, sodium citrate).